In August, Peggy will perform with Sonic Calligraphy a one set program of Chinese folksongs, poetry, originals, and jazz standards at Cornelia Street Cafe. Special guest, NY trombonist Chris Washburne will join her and Swiss pianist, Adrian Frey. In the first set, the Peggy Chew Trio will play holiday songs to celebrate Yuletide. In the second set, Peggy will conduct a Christmas sing-along with the public to the humorous and elegant accompaniment of Robert Ashby on piano. In September 2007, "Sonic Calligraphy" toured China with several concerts in Hong Kong, Kunshan and Shanghai. Joining them on this musical journey was Willy Kotoun on percussion. 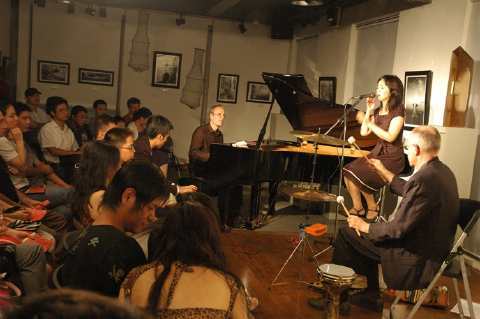 It was the second China tour for Peggy and Adrian after their duo appearances on the mainland in 2002. "Smart music fuse of culture without boundaries…the vision of Sonic Calligraphy…The Chinese tune “Lan Hua Hua“ (The Orchid) was hip,catchy and hot…"Li Bai’s Mood" (Frey) accompanied by the words of an ancient Chinese poem "Quiet Night Thoughts" spotlighted Chew’s eloquent vocal charm inside a whirl of expressive percussion. The extraordinary musicianship of Sonic Calligraphy is obvious." In January and February 2007, Peggy Chew and Adrian Frey shared musical experiences in Brazil where they participated in jam sessions and concerts in Rio de Janeiro and Joao Pessoa. In May 2007, Peggy was a guest soloist of the JCT All Stars in Thalwil, Switzerland as part of the International Thalwil Jazz Weekend.